In the last instalment of this column, we looked at some of the many ways you can cut brass for your automaton project. Once cut, there is a good chance you will need to bend the brass in some way to suit your needs. Let’s take a look at some of the methods for bending brass rod, tubing, bar, and sheets. 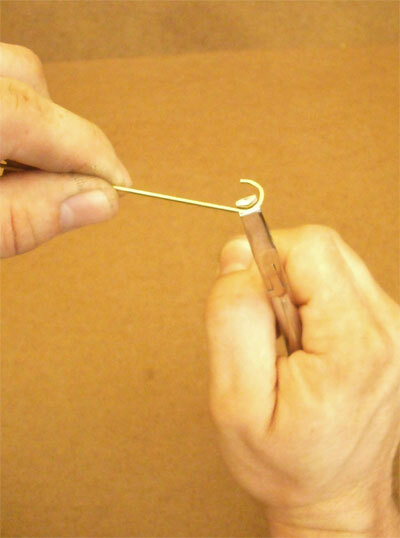 For the thinner gauges of brass wire, you may be able to use your hands alone. For the heavier gauges, pliers are an indispensable tool. Use the pliers to hold the wire in one hand, while manipulating the other end of the wire with your free hand. To create curved shapes, crimp, bend, and release the rod at intervals along its length. The closer together these intervals are, the tighter the curve will be. Round-nosed pliers are great for creating tight curves and loops. Simply bend the rod around the rounded jaws. 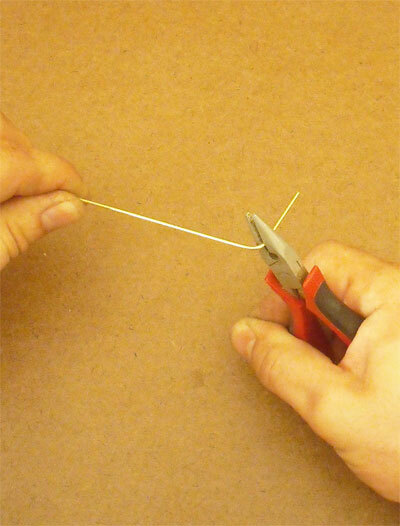 Sharp bends can be made with a pair of pliers in each hand. Various types of special metal-forming pliers are great for bending shapes in wire. While these pliers are useful, most of these bends can be made with a pair of flat needle nosed pliers and a pair of round-nosed pliers. If you find that any of your pliers are leaving a lot of unsightly tool marks on the rod, buy some pliers with nylon pads on the jaws or wrap masking tape around the jaws. For complex bends, or bends in wire that is particularly heavy, a bending jig can make the job much easier. The jig can be mounted to a bench or a board, which can then be clamped down if necessary. 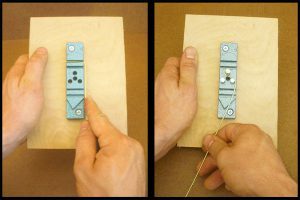 The jig features a series of slots and pegs. By placing the rod into the slots or between the pegs, you can use your hands to bend the rod to conform to that spot in the jig. In addition to allowing you to use both hands, this tool minimizes the number of tool marks left on the wire. Brass tubing can be tricky to bend because it has a tendency to kink and crush. One type of tubing bender consists of a coiled metal spring which is wrapped around and/or placed inside of the tubing while bending it. The coils of the spring support the walls of the tubing, reducing the chances that it will crush. They come in various diameters which correspond with many common tubing sizes. To use a spring bender, select one that just fits over the outside of the tube to be bent. Slip it over the tubing so that it is centered on the spot where the bend will be. 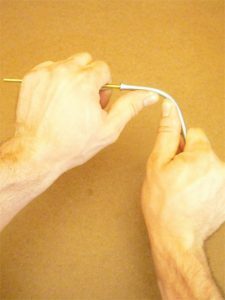 Using both hands, bend the tubing by pressing your thumbs into the bend. The likelihood of a successful bend are even better if you are able to use another spring that fits within the tubing. These can be made from common extension springs found in most hardware stores. Model airplane enthusiasts and those who work on heating and cooling systems often use a different type of tubing bender. Check out the resources section at the end of this article for more information on these tools. For thicker brass bars, consider scoring the bar prior to bending it. By removing some of the metal on the inside of the bend, you create space for the metal to fold in on itself. The scored line also ensures that the metal will bend at the spot you intend. Use a permanent marker to draw a line where the score will be made. You can use a triangular file or a square file with one edge facing down. File a groove along the marker line starting at one edge of the bar, working to the opposite edge. You want an even 90 degree trench running from one side of the bar to the other, a little bit deeper than half the thickness of the bar. Once you’ve finished scoring the piece, place it in a vise with the scored line exposed. Bend the piece to form a neat 90 degree angle. Because you’ve removed so much metal, you may even be able to bend it by hand at this point. The finished bend has no visible seam on the outside and a tidy partial miter on the inside. This joint can be soldered if additional strength is required. Making straight bends in metal sheet can be difficult, but some tools and aids make the job easier. 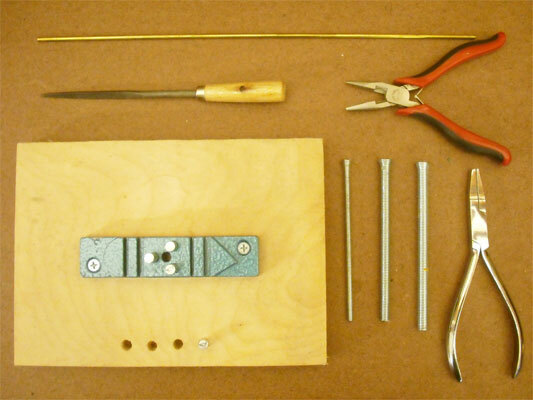 To bend brass sheet, sandwich it between two wooden boards within a vise. 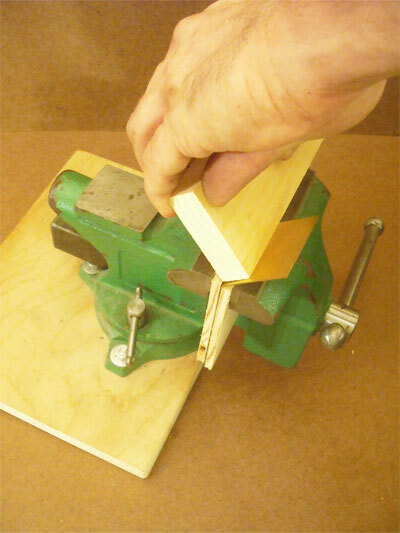 Use a third piece of wood to apply pressure to the metal for the bend. The block of wood helps you apply pressure to the entire edge being bent and prevents the metal from be being marred. You can also tap on the wood block with a mallet or hammer. You will probably find that in many cases you will need to ‘overbend’ the metal — going a bit beyond the shape you want, in order for the metal to retain the desired shape. 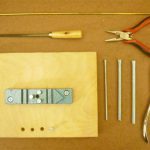 As with Part 1, this article only covers some of the many methods for bending brass. I recommend that you research other trades, crafts, and hobbies that use brass. You might be surprised by how many techniques you find!